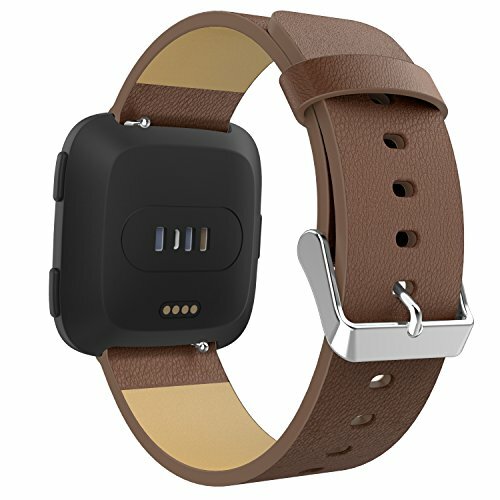 Custom designed for your precious Fitbit Versa Fitness Wristband, this MoKo Fitbit Watch Band features a combination of functionality and style. * Personalized Your Fitbit Versa Smartwatch Heart Rate Fitness Wristband with this refined replacement wrist band. Smart Watch NOT included. * Available in Genuine leather Print Pattern for a classy look, lightweight and durable, easy to install and remove. * High quality stainless steel connector is durable and long lasting. * The release pins make the band easy to install and remove, and the strap length can be adjusted easily. Solid well grinded and polished stainless steel buckle clasp for closure. * Flexible wristband with smooth finishing for comfortable day to day wear. * Fits 5.11"-7.48" (130mm-190mm) wrist and 0.9"(23mm) in width. * 18-Month warranty. Please search "MoKo Fitbit Watch" for other accessories offered by BSCstore. Flexible wristband with smooth finishing for comfortable day to day wear. 5.11"-7.48" (130mm-190mm) wrist and 0.9"(23mm) in width. Personalized Your Fitbit Versa Smartwatch Fitness Wristband for woman man with this refined replacement wrist band. Smart Watch NOT included. Available in genuine leather Lichee pattern for a classy look, lightweight and durable, easy to install and remove. High quality stainless steel connector is durable and long lasting.The release pins make the band easy to install and remove, and the strap length can be adjusted easily. Solid well grinded and polished stainless steel buckle clasp for closure. 18 Months Warranty: MoKo stands behind the quality of everything we sell. We provide worry- free service. If you have any question or problem, please contact us, we will resolve it for you effectively.